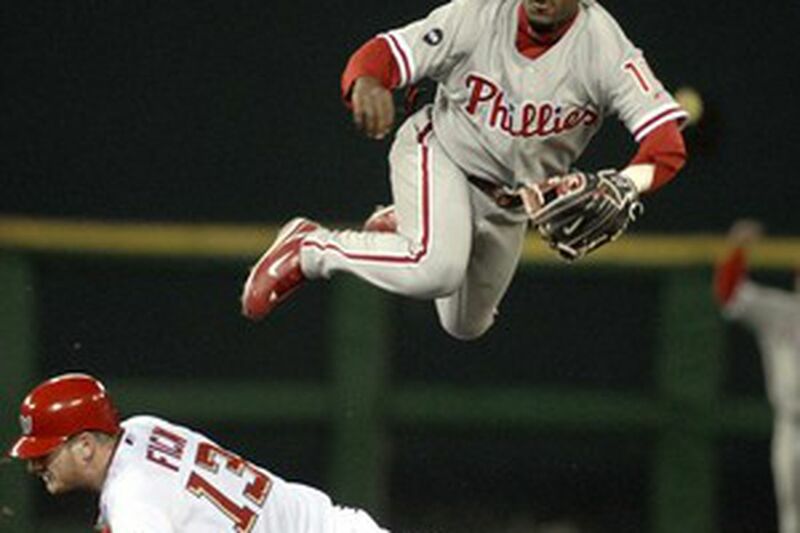 Jimmy Rollins leaps over Nationals' Robert Fick after throwing to first to complete doubleplay. WASHINGTON - Jon Lieber insisted that he was probably a better starter than a reliever. He showed it, to a degree, with a pair of atrocious outings. They reinserted Lieber in the starting rotation, where he opened the last two seasons as the No. 1 man in the rotation. In a shocking move, they took No. 1 starter Brett Myers out of the rotation and made him the setup man after his second-worst back-to-back starts of his career. Lieber will start tomorrow in Cincinnati. The righthander will be able to throw about 70 pitches. Not that Lieber considers himself of Myers' ilk. "I still believe Brett is our No. 1 starter. I think he deserved that role," Lieber said. "If people look at a couple of bad starts from him for being in the situation he's in, they're obviously wrong." Myers had agreed with general manager Pat Gillick to consider a move to the bullpen as a closer if Tom Gordon faltered or was injured. Manager Charlie Manuel and pitching coach Rich Dubee occasionally discussed moving Myers to the bullpen as Gordon's understudy a few times, since it became evident Gillick would not be able to trade Lieber for bullpen help. Ryan Madson, Geoff Geary, Antonio Alfonseca, Matt Smith, Francisco Rosario and Lieber did nothing in the first dozen games to distinguish themselves as solid setup men. Gillick could not procure one. Yesterday, with Gillick's blessing, Dubee and Manuel created one. Myers agreed, with the caveat that once he goes to the bullpen, he stays there all season unless a starter suffers a long-term injury or is traded. He could return to the rotation next season. "I told them I didn't want to get bounced back and forth all year," the righthander said. "If I'm going to get my mentality set on being a setup guy, that's what I want to be. I don't want it to jump back and forth like it did with Madson last year." Madson has failed to recover his effectiveness after a failed stint as a starter last season. The Phillies always have believed Myers has killing bullpen potential. They love Myers' velocity, which, they hope, will consistently be about 93 mph as a reliever. Dubee believes that Myers' eager-beaver attitude will serve him well as a reliever, and he thinks that pitching one or two innings will be better for Myers, who, Dubee said, sometimes loses focus during a start. And this could be an apprenticeship for Myers' career as a closer - a possibility Myers embraces. "It's always out there. It depends," Myers said. "If I can succeed as a closer, and that's what's in the cards, then that's what I'll do. I like having the ball in my hand." The Phillies foresee rollicking success. "I look at him like John Smoltz or Dennis Eckersley," Manuel said. They have Hall of Fame credentials. Myers only aspires to help the Phillies win now. "I'm a team player. I'm not going to be selfish about it," Myers said. "If this is what it takes to get us to the playoffs, then this is what I'm going to do." The Phillies know Lieber can be an effective starter. He went 17-13 in 2005 and, after overcoming a rough start and a groin injury in 2006, he went 5-3 with a 3.38 earned run average during the Phillies' unexpected run at the wild card. With those credentials, Lieber, 37, was not happy in the middle of March when he discovered he would open the season in the bullpen. He even asked to be traded. "Yeah, some of the things I said in spring training, I was upset for a day or 2 there, but those feelings are gone," Lieber said.